All of a sudden, one emerald green tree branch after another flew out of Nie Tian’s ring of holding and pierced into the ground around him. As soon as they formed a certain formation, emerald green light rose from them, forming a hemispherical ward around Nie Tian. In the meantime, the mysterious tree patterns that carried the profound truths of wood power flew out of the tree branches. They joined the semi-transparent green ward and roamed about in it, vesting it with a resilient and tough force. As Hong He’s hand slammed down towards the the mysterious green ward, numerous roaming tree patterns quickly gathered towards the top of the ward. A vigorous force burst forth from the contact point as golden light splashed in all directions. Hong He was instantly sent staggering a few step backwards by the intense counter-force. Shock and confusion filled his face. Tiny green sparks fell from between his trembling fingers as the formidable force from the green ward gradually wore off. “You think your spiritual tool can save you? !” With intense killing intent in his eyes, Hong He summoned a streak of fierce psychic power and shot it at the green ward. In the next moment, his mind was shaken violently as the streak of psychic power he had wished to kill Nie Tian with dissipated into thin air. After neutralizing the golden lightning bolts, Dong Li dashed over, summoning the cyan awl back to her hand as she did. Then, with a swift slash with it, she formed multiple beams of cyan light. Hong He, who was going to launch another attack, hastily prepared for engagement. He and Dong Li constantly shifted about in midair as they exchanged attacks, filling the sky with cyan and golden sparks. Sitting among the seventy-two tree branches, Nie Tian’s eyes were still closed as he focused on the transcendence and upgrade of his spiritual sea. Meanwhile, he was actually keeping a close watch on everything that was happening around him through his Heaven Eyes, including the Heaven Palace Sect’s imposition, Dong Li’s compromise, Hong He’s return, and their current fight. However, since he was in the middle of his breakthrough, he couldn’t mete out justice for Dong Li at such a critical moment. The only thing he could do was spare sliver of his mind to form a protective ward around him with the seventy-two tree branches so that Hong He wouldn’t be able to threaten Dong Li with his life. In fact, he hadn’t been sure how the tree branch magic would work out. However, the result had proved that the tree branches, which had absorbed all of the mysterious tree patterns from that Floragrims’ ancestral land, had incredible power and uses. With the help of the floating tree patterns, the green ward successfully fended off Hong He’s attempt to kill him. After seeing that Dong Li had dashed over and gotten into a fierce fight with Hong He, he felt slightly relieved. He was well-aware that, even though Dong Li was at the middle Greater Heaven stage, which was lower than Hong He’s cultivation base, her actual battle prowess would probably be higher than Hong He’s, since the Dong Clan had put in an almost limitless amount of resources to help her grow. As long as Hong He could no longer use him to threaten Dong Li, she would be fine. While the two of them were engaged in a heated battle in midair, Nie Tian forced himself to calm down and focus completely on his spiritual sea. At this moment, the eighth vortex of spiritual power had already fully formed in his spiritual sea. What he needed to do now was finish the expansion and refinement of his vortexes of flame power, wood power, and star power. Only after expanding and refining all of the vortexes in his spiritual sea to their limits would he be able to finish the breakthrough, given that he had already found the right enlightenment and entered the right state of mind. Considering he had recently finished the expansion and refinement of his vortexes of flame power and wood power, he only needed to concentrate on upgrading his vortex of star power now. One Star Stone after another lost their splendor and turned into ordinary stones in his palm. Countless wisps of star power flew into his vortex of star power. As the vortex spun at an increasingly high speed, the star power condensed into glittering drops of stardew which then joined the lake at the bottom of the vortex. As the lake of stardew slowly rose and expanded, it gradually reached its limit. He was finally able to spare some of his attention to observe the battle between Dong Li and Hong He. Dong Li seem to have become one with her black phoenix as she attacked Hong He. In one moment, she charged into the sky. In the next, she spread her arms and swooped down from the sky, like an eagle swooping down on its prey. The late Greater Heaven stage Hong He was well-versed in wielding metal power. At this moment, he was countering Dong Li’s attacks with the Heaven Palace Sect’s secret incantations, holding a shiny, golden sword in his hand. “Cross Slash!” Every time Hong He swung his golden sword in the air, a shining, golden cross would appear before him and shoot towards Dong Li at lightning speed. Dong Li, on the other hand, would fend it off with her bone shield, while launching counterattacks with her cyan awl. She didn’t seem to be under much pressure. Seeing this, Nie Tian felt more relieved, and refocused on his breakthrough. Soon after Hong He had parted with the team, Huang Hu had also split up with Su Lin. After failing to discover any precious materials in that area, he also started moving stealthily towards the location where Dong Li and Nie Tian were. Having known Hong He for years, Huang Hu had a good idea as to what kind of person Hong He was. The moment he had proposed to split up and search, he had realized that he had set his mind on Dong Li. Unlike Hong He, Huang Hu didn’t have a strong interest in women, though he was very greedy when it came to valuables and treasures. Su Lin had been satisfied after getting the Earthshatter Beast’s eye from Dong Li. However, what Huang Hu had wanted was to kill Nie Tian and Dong Li both, and pillage all of their belongings. While he felt frustrated about his fruitless search, it suddenly occurred to him that, since Hong He had gone to force Dong Li to be with him, he could probably go to demand valuables from Dong Li and Nie Tian as well. Meanwhile, it had already been some time since Hong He had parted with him and Su Lin, so he imagined that Hong He might have already gotten what he wanted. If he went over now, not only would he not interrupt Hong He’s business, but Hong He might have killed Dong Li and Nie Tian already. He might just get there in time to split the spoils. As he approached, he caught sight of Dong Li stretching her well-built body in the air before swooping down with the strength of her black phoenix. One streak of cyan light after another shot down with her, clashing with Hong He’s golden crosses. With these thoughts, Huang Hu picked up his pace. At the same time, Nie Tian finally finished his breakthrough and successfully entered the middle Greater Heaven stage. The moment his eyes snapped open, he shrewdly sensed that Huang Hu was rapidly approaching. With a swing of his arm, he summoned a tree branch to his hand, and all the others into his ring of holding. A chaotic magnetic field instantly enveloped him and expanded to cover a five meter range around him. Now that he had entered the middle Greater Heaven stage, the speed at which his chaotic magnetic field expanded and the intensity of its twisting force were both greatly enhanced. His chaotic magnetic field was powered by the different types of power he practiced. Since all of those powers had become more refined after his breakthrough, it was natural that the might of his chaotic magnetic field had risen to a new level. “Starshift!” With a thought, he vanished from where he was sitting. Hong He, who had failed to subdue Dong Li after so many exchanges, looked rather edgy. He hadn’t expect that the gorgeous Dong Li was actually such a tough bird. Even though her cultivation base was lower, her battle prowess proved to not be inferior to his in the slightest. Meanwhile, she was able to fly about with the help of her black phoenix, which made her even harder to handle. His golden lightning clashed with Dong Li’s cyan spiritual power in the air, filling the sky with dazzling light. At this moment, he was swinging his sword wreathed in golden lightning to cast more Cross Slashes. All of a sudden, the vortexes of spiritual power in his spiritual sea suddenly stopped spinning under the influence of some magnetic force, which caused the golden lightning around his sword to flicker. In the next moment, he felt as if all of his internal organs had suddenly been twisted. His face turned pale with shock. He hastily calmed himself, then attempted to stop the great changes inside of him and restore functionality to the vortexes within his spiritual sea. A slightly chilly tree branch that carried rich wood power suddenly pierced into his back. Gasping, he turned around. Upon seeing Nie Tian’s brutal smile, he was scared out of his mind. Just as he was about to raise his sword, the tree branch blossomed with blinding light, sending a streak of rich wood power into him, where it rapidly turned into a small, green bud. It grew at an alarming speed as it madly drained Hong He’s flesh power, along with his life force. Before he could do anything, the expanding branches and thorns penetrated his five yin organs and six yang organs. “Do you know who killed Ning Yang?” Nie Tian asked with a brutal smile. “Umm!” Hong He was too shocked to say anthing. “I did!” With a cold laugh, Nie Tian raised his hand high in the air and vigorously slapped the top of Hong He’s head. Upon contact, different types of power poured in like an uncontrollable flood. Hong He’s skull cracked as it was almost slammed into his chest. He dropped dead before the Heavenly Wood Thorns could kill him. Tale: Sai Weng lived on the border and he raised horses for a living. One day, he lost one of his prized horses. After hearing of the misfortune, his neighbor felt sorry for him and came to comfort him. 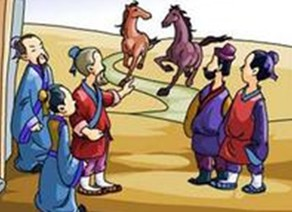 But Sai Weng simply asked, “How could we know it is not a good thing for me?”After a while, the lost horse returned and with another beautiful horse. The neighbor came over again and congratulated Sai Weng on his good fortune. But Sai Weng simply asked, “How could we know it is not a bad thing for me?” One day, his son went out for a ride with the new horse. He was violently thrown from the horse and broke his leg. The neighbors once again expressed their condolences to Sai Weng, but Sai Weng simply said, “How could we know it is not a good thing for me?” One year later, the Emperor’s army arrived at the village to recruit all able-bodied men to fight in the war. Because of his injury, Sai Weng’s son could not go off to war, and was spared from certain death. The proverb can be read to have multiple implications when it comes to the concept of luck and furtune. The end of the story seems to suggest that that with every misfortune comes with a silver lining or a blessing in disguise. But within the story is also the sense that with what at first appears to be good luck can come misfortune. However, this proverb is more commonly said when bad luck turns to good than when good luck turns to bad.